I love using bilingual books to enrich my vocabulary in Arabic. I read them through in Arabic and use the English text as an easily accessible “dictionary” for any words I don’t know. As a parent, I also use bilingual books so that I can read the same story to my son in one language while my husband my read it in another! Bringing up children bilingually requires constant flow of new ideas on how to provide enough input of the second language. Since English is not a native language for neither of us, the situation is even harder. Maja (5) is going to school next year, so we have already started to teach her reading, in both – native Polish and non-native English. For that reason bilingual books seem to be the best choice at the moment. I teach young children in an Arabic speaking country. I would love the children I teach (mostly English as a first language) to have exposure to Arabic through the wonderful medium of picture books. It is very hard to get hold of good ones here. Shar. When learning a foreign language, I find that the text book can only get you so far. I love to find a variety of bilingual books to practice vocabulary and more importantly to become comfortable with sentence structure and natural-sounding word order. I am learning Hindi and finding children’s books is quite difficult in the U.S. I have loved every Language Lizard book I have ordered- I appreciate finding text geared toward different skill levels, and I love the gorgeous illustrations. This would be a great addition to our study materials. In attempting to teach my daughter Arabic I’m also trying to learn the language. My goal is to raise a bilingual child in hopes of expanding to a multilingual adult. I am always looking for new ideas and tips to incorporate into our dual language Head Start program. We want our Spanish and Somali familes to feel like they are an important part of our program. After all, they have so much rich heritage to share with us!! Thank you for providing new insight on how to make this process a success! We read bilingual books at home with our children – Spanish and English. Grandma could use French/English books with them as well 😀 Plus I would like to donate some in Spanish/English and Portuguese/English to their school. I’m so grateful for the opportunity for my boys to grow up biliterate – hopefully multiliterate! I like bilingual books to use with my friends to both enrich our language skills and as an opener to have discussions about our languages, why we say certain things. Further they are also really nice for selfstudy. When I am with smaller children I really like the childrensbooks that are bilingual, because it is a great way to get kids in contact with other languages already. I am hoping to help my daughter speak more Polish and think bilingual books are a good method. Polish is a minority language in the household, and English is dominant. More Polish books would be great. We use bilingual books at home with our 7 year old son and 4 year old daughter. We speak Spanish and English and are taking a stab at Tagalog. It is so important to have quality books available to enrich their vocabulary. As they grow older their interests and needs change so it is great to have a variety of literature for them. Thank you for offering such great books, tips and giveaways. I love using bilingual books for my children! They can see the words written in Portuguese and are able to identify different animals and colors in Portuguese. It’s also great to allow their grandparents to spend more time with them reading since they are not fluent in English. Using bilingual books is just a great way to introduce books you grew up with in your language in the other language so that the tradition can carry on. I would donate the books to my son’s bilingual (Spanish-English) school! We could really make use of these to supplement our Spanish learning at home and also in his classroom. I believe teaching a child another language is a gift from God. I believe in using many tools and resources. This is a great tool and using it helps not the child in front of you but the also the children that hear about it. it contagious and worth it, so why not use it….and pass it on. Bilingual competency is no longer a nice-to-have. However, it is a lot of work when working with (against) schools and individuals who have a English-only bias. You have to work extra hard to create a favorable environment. I am excited for those resources, which hopefully give some rest to a parent’s vocal chords. Thanks for the initiative! I would enjoy using the literature, to assist my children in their quest, to become bilingual. If I won, I would give the books to our elementary school where we are most likely securing FLAP grant to hire a Manderin teacher. I might keep a few spanish and hebrew books aside for my son to read too! My daughter recently started Spanish immersion kindergarten and these sorts of materials would be great for the school library! That interesting. Can someone tell me how those books are written ? Are there two languages merged together aka : one phrase in lang1 and second in lang2 or how ? In response to Marlene’s comment above, each of the dual language books has both language texts on each page or on facing pages. So, as an example, a Spanish-English book would have the words/sentences for each page written in Spanish at the top the page and in English at the bottom. My 18 month old attends French class in Manitou Springs, CO. We’d love to have these books to share with her classmates! I would use the books both with my own 3 children from Korea that I homeschool and share those books with Camp Mujigae (the Korean cultural camp) that I volunteer at. I help with the youngest group of campers ages 5 and under. I have a parents resource table full of my own children’s books, pamphlets, business cards, brochures, catalogs, etc related to Korea and adoption for the parents to look at and take. My daughter attends a Farsi language immersion preschool here in Berkeley, CA, and we speak Farsi at home as much as we can. It is virtually impossible to find good children’s books from Iran, so I love Language Lizard’s bilingual books! I was an exchange student in Portugal, so when I was pregnant, I decided that I would speak Portuguese with my child. Since it’s not my native language, there are some gaps in my knowledge of the language (primarily baby/child-related vocab, since I went in high school), but by reading to my child in Portuguese, and having the English text to refer to if necessary, I’m not just preserving my Portuguese, but expanding it. Using bilingual children’s books has been my son’s most enjoyable way of expanding his Vietnamese vocabulary. These books have helped him learn colors, animals, and high frequency grammar construction. I have even recorded his Vietnamese teacher reading the books. Now he is beginning to repeat parts of the book in his play. I would donate the books to the only dual language public elementary school in Rhode Island (International Charter School in Pawtucket where my son attends 2nd grade). They have two strands Portuguese/English and Spanish/English. Using the Language Lizard books has been an enjoyable way for our family to learn together! Being a multi-language household that has been primarily taught our native languages by family, the books enable us to expand our vocabulary & grammar. I love an idea posted of recording family & teachers reading the books aloud! It’s a challenge finding books in Greek for my son, but worth it. I speak to him only in Greek, and I find that he enjoys staying with the Greek when we read books together. This way there is a continuity between our communication with each other and the stories we share, and we often thread the new vocabulary and characters back into our daily play. I love your books the quality is wonderful. As a parent I buy for my family and whenever I am working on a parent organization I make to have a “fundraiser” (which one is coming up). It was wonderful, when I served as president of a Parent Organization (which is located in a diverse community) and we were able to donate Goldilocks and the Three Bears in 33 different languages. I’m a grammy who will be home schooling my grand daughter. She is already picking up some German, especially because she loves the books we got from Language Lizard. Learning more than one language is such a great, brain expanding tool! My ideas for bilingual books involve sending them to a young child I sponsor in India, to help introduce him to English as he’s learning his native Bengali. If I won the contest I’d be able to share the prize with other sponsors that I know who could do the same for their sponsored children overseas. I would love to increase my son’s Arabic library. Living in the U.S., it is hard to compete with the English books he receives from family and friends and I’d like him to learn the value of reading in Arabic early on! Since I only read English, bilingual books help ME to learn as well both when my husband reads to our son and when I read the books myself. I am teaching a native language class (Spanish) my students are not fluent in English and I hope that with the help of bilingual books they can become proficient in boh languages. This is a great opportunity to also engage them with reading material that they will like. When bilingual books are added to a classroom and the teacher and assistant teacher read the book together (rotating the language with each page) at circle time, it enables the children to be exposed to another language at a very early age. Students can be taught words individually or collectively. It’s a great way to teach languages! I am learning French as an adult and I use the books to increase my familiarity with the phrasing, spelling and grammar of the French language. I also use them with my grandchildren to introduce them to the French language, before they are old enough for formal lessons. I read the page in English, then in French ( and try not to worry too much about my pronunciation!) I feel the earlier the children are introduced to a second language, the more comfortable they will feel in pursuing this learning as they grow! In a ever shrinking world bilingual skills are important. Our (U.S.) schools are definately increasing the number of English Language Learners. Bilingual books help to faciliate the students absorbtion of English. In today’s economy and in particular the lack of school funding, if I would win the book give-a-way the books would be donated to my local ESOL center school. I have bought Language Lizard books in the past, and they are absolutely wonderful! I would love to have more bilingual books for our children’s bookshelf. All 3 of my young children are growing up bilingual (English and Arabic) and I am so thankful that they have the advantage of knowing two languages. If I win the books, I will use them at home with my children, and will also bring them in to class when I’m teaching. I teach English to Arabic children in the village where I live, and the kids would love to see their own language in the books as well as English. It’s hard to find simple and entertaining storybooks in Arabic for non-native speakers. Language Lizard has a great selection. I use the books to help teach my children the Arabic language, and also plan to integrate them into the curriculum at our local weekend Arabic school. I found language lizard when a local children’s hospital asked for some foreign language books to expand their children’s library. Getting the same book in multiple languages not only lets the staff and volunteers follow along but means kids who are naturally curious can see the same story in several different languages and compare them. They were very excited when I took the books over! I wish I had access to these when my children were young, but my granddaughter on the other hand is at her “book fascination” stage and bilingual books have been an awesome tool! I have purchased books in the past for our bilingual parent advisory meetings and have been very pleased with the quality. Our district is going to open a dual language program next fall and would love to use the $250 prize to add much needed quality literature to our classrooms. I think Language Lizard does an amazing job of getting books of unique languages into the hands of young readers. We have new friends from Brazil who have just moved to the U.S. Their little girl will be learning English soon. I’d like to get her some Portuguese/English books to help her in learning our language, and for my children to learn some Portuguese! After use, I would like to donate these books to our Brazilian friend’s school here in the U.S. There are other Brazilian families who have settled here. I am a parent coordinator in a school with many newly arrived immigrant families. Bilingual books are a wonderful way to support language acquisition for our students and our teachers alike. It’s great to see students and teachers reading to each other, sharing their languages and helping each other learn. My husband grew up in Portugal and the dual language books help him share his culture to our kids in a fun and easy way. My idea for other books would be to offer comic books. My son loves reading comics and I think he would enjoy comic books that he could read with his dad. I love reading bilingual books to my kids. I’m fully fluent in conversational Chinese, but I can’t read and write Chinese very well. So I have a hard time finding childrens books that I can read to my kids in Chinese. The bilingual books help a lot. The English text gives me clues about what the Chinese text is saying! Reading to kids is a great way to help them learn a language. We are active in international cultural exchanges. 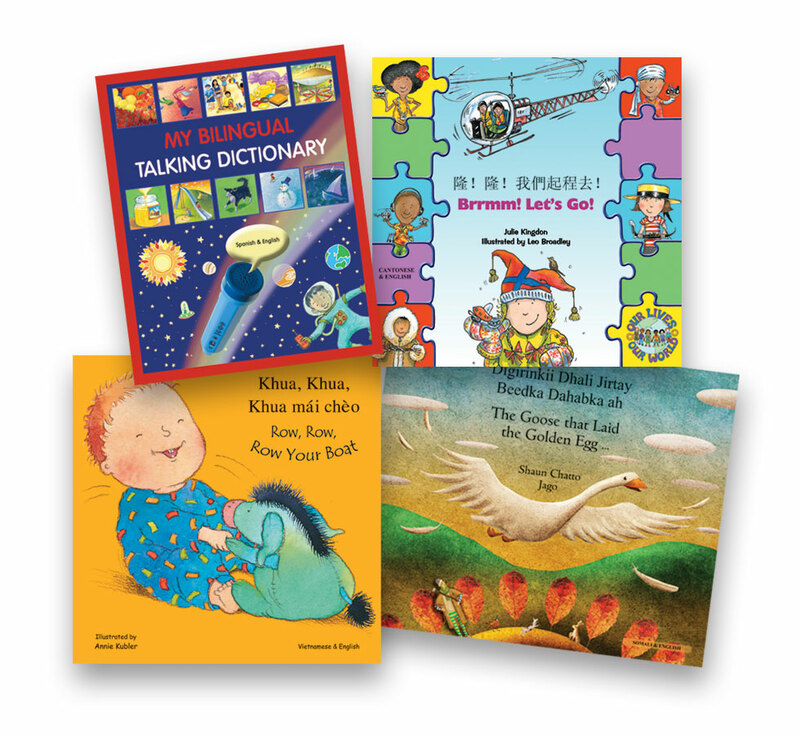 Bilingual books are great gifts (and easy to pack) for families whom we visit or host. Personally, we utilize bilingual books (Spanish) with my 18-month-old. Her nanny is biliterate and the language that she and my daughter speak is Spanish. We have a growing library that they pull from throughout their time together of texts that are bilingual as well as solely written in Spanish. Professionally, I work with many children who’s first language is Spanish. I rely on the bilingual books to engage these children and build rapport with them as I help them work through a very stressful time. Our children’r grown up learning 2 languages; Turkish and Greek.. then when they go to school, they learn at least one more language. Bilingual books add to my students culture and learning. Many times they’re language is lost over the generations or by English immersion. I tell all my parents how important it is to help their child keep they’re native language. Not only is it a part of who they are but the stronger they’re native language, the better they learn English. Bilingual books help keep they’re language and culture alive:). I use bilingual books so my husband can read to our son in Turkish and also so I can learn Turkish as well. They are a great source! I have gotten plenty of fabulous books from Language Lizard for our son…thanks! We use books to encourage the home to school connection for our children. We send books home so parents can read to their children EVERY DAY. Since many of our families are Spanish speaking we try to send home books in Spanish! We serve families in a low income, at risk community. As such, books are a luxury item for our families. Knowing this, we make every attempt to make books and education accessible to our families. By entering giveaways, applying for grants and purchasing discounted titles in bulk we provide many children and their families with books so that they and their children can be successful!! We would use the books in our ELL classroom to support language instruction and understanding. We do not have many/any bilingual books at this time and our budgets are cut more and more each year. Anything we can do to help support this effort is awesome!! Thank you for this opportunity!! We have searched the web for collections of bilingual books and this is the best resource! The selection is wonderful. I’m the librarian in a small elementary IB school. Finding ways to increase our childrens knowledge of other cultures and languages is so much easier now. Being able to show our kids several books in both English and numerous other languages is eye opening for them. To be able to compare the same stories in Madarin, Tagalog and Polish gives them more clarity. It’s easy to say people around the world use different languages but the ability to show them means so much more. This is an amazing giveaway! I would absolutely LOVE to win a set of bilingual books for our classroom. I am currently reviewing a Spanish curriculum with my 3 1/2 almost 4-year old daughter. She LOVES Spanish class and is very eager to learn Spanish … and sign language. I would read the Spanish version to her (and possibly other children) and since my daughter can already read fluently she would read the English version (with assistance if needed). This is a great way to increase vocabulary and introduce cultural differences to children. It is hard at times to find appropriate, good quality bilingual books for us to use … I find myself checking books out at the local library (let me tell you … bilingual and spanish books are limited there) only to find that the book was not appropriate in some way or another. I would also create art and hands-on activities to use with the books as extensions. This has been a new passion of mine. If I were to return to the classroom then I would also use them to teach Spanish to my students during transition times or at a foreign language center. I am also considering inviting children from our library story time to join our Spanish class to make it even more fun and to allow them the opportunity to learn another language. I think that in today’s society it is very important to be exposed to another language if not more. Bi-linhual books are great resource for bilingual kids and kids trying to learn a new language. I applaude Language Lizard for this. I also love the availability of books in so many languages! Very much well worth it! Bilingual books are such a great idea! Research shows that children that grow up speaking more than one language generally reach further goals later in life. I like to take advantage of anything that will enhance my children’s learning and ultimate future endeavors. Thanks to Language Lizard for making it possible to find bilingual books all in one place. My husband uses language lizard books to help teach his Romanian language to our daughter. And I like to read to her in Spanish to increase her and my vocabulary. Many of the books we can choose from have beautiful pictures and great stores. Thanks. We are a home school family and teaching dual language (English/Spanish). I get very excited when I find great books and educational materials that help us further our Spanish education. These books make wonderful gifts for bilingual, adopted and any kid. They are always appreciated. Dual language books are an excellent classroom resource for partner reading. I have had students partner read in English, then in Spanish, and relate a summary of what they read. Students really enjoy being able to use or show off their knowledge of their native language in the classroom. Using bilingual books in storytime is a great way to engage families in literacy. Not only can one reach out to multicultural families, but English speaking families can get a taste of the many traditions throughout the city and build their own vocabs! Bilingual books are great! We are raising bilingual children in our home, and we are always trying to find ways to make it easier and more fun! We have a number of refugee children who come in to our organization, and we hope to establish a small library of children’s books in Spanish, Arabic, French and Haitian Creole for them. Of course, Language Lizard was my first place to look! Raising bilingual children can be challenging. Any resources available out there is one more tool to make our (the parents) job a little easier. In my opinion, bilingual books are especially important when one parent speaks one language and the other parent speaks an other. My husband and I read those types of books to my son regularly. I suggest reading them before going to bed with each parent reading their native language to the child. As a Spanish teacher, I love using bilingual books to teach my students the language and culture of Spanish-speaking countries. As the mother of a daughter who is half Vietnamese, it is important to me to try to learn the language and read her books about the language and culture of her father. We are all learning Mandarin (mum, dad and 5-year-old daughter). Reading children’s books is great practice for all of us. I will be using bilingual books in my 1st grade Spanish Immersion classroom! I would love to be able to send them home nightly as homework books. This would be even better than sending home the Spanish books because the parents will understand what the books are about! I would use them to help expand my daughter’s vocabulary. She already knows some basic spanish from Dora, but she will be attending French Immersion in Canada and I would love to give her a head start on some basic vocab. I am new to this site and already very impressed and intrigued. I can honestly say I never knew so many bi-lingual books were available and in so many languages to boot! I’m a bachelor student studying in Early Education Special Education and Human Development in Family Services so having a variety of books in multiple languages is very important in any career path I choose to follow with my degree. I sure would love to win this give away to help extend my library to help those in need. Many bi- and tri-lingual families visit our library. Bilingual books make it easy for parents to teach their children to read in both English and their “home” language. These books are also useful to develop literacy in people who learned to speak, but not read, a language. Reading the language they can read, and then in the language they can only speak helps them learn how to recognize written words in the spoken language. We also recommend bilingual books to language learners of any age. We would love to make more bilingual resources available to our patrons. Working in an international school in Germany makes it challenging to get books for children who come from many different countries. We want to honor each mother tongue so that every student feels welcome and valued. Finding Bi-lngual books in the library or classroom with your language next to English is a great way to get the students involved in school life. We get them to read (if they can) the book in their language to the class so everyone can experience the new language and share in the feeling of listening to a language you don’t understand. love all the language options! My father is a native gujarati speaker, and my mom is a tagalog speaker. It is great to have these options! I studied Russian in college and hope to pass some of that on to my children, specifically my baby daughter. Bilingual stories will help her learn the language more naturally than traditional classroom study and will also ensure she is hearing correct Russian. Also, if I return to private Russian tutoring some day, the stories will greatly benefit my work with children. I am glad that I found this website. I speak English and Spanish. I am glad that I found books in English and Portuguese. I volunteer with ESL Advanced Adults. These books will help them with their English and with their grandchildren. I am glad I found this website. I speak English and Spanish. I am glad that I found books in Portuguese and English. I volunteer with ESL Advanced Adults. These books will help them and their grandchildren. I use bilingual books to strengthen my grasp of Gujarati and we use billingual books with our daughter to teach her three different languages. I would love to have bilingual books so my son can learn his father’s native Slovak language as well as his mother’s (me) Spanish language. We are already practicing but picture books and stories would be more beneficial to his learning experience. I use the bilingual books as a parent involvement piece. I send them home with the students and have comprehension questions with them. My students and their parents get to read together and then discuss the story. We are a home school family and we speak three different languages at home namely: Yoruba, Arabic, and English. Your language books are added assets to our home school diverse library. Keep up the good works, Language Lizard! I love these books! I read them to my daughter and expand my own language base and vocabulary at the same time. They also make awesome gifts for multi-cultural families. As a support provider for dual immersion programs in 6 languages at 9 schools, it would be wonderful to be able to provide the teachers with a few more books for their classrooms. There can never be enough quality children’s literature available to the students. We use bilingual books all the time with young bilingual children at school and also at home with my daughter. They are great for everyone so that we can expand vocabulary and check for comprehension in either language. Read alouds and sheltered vocabulary lessons of course enrich language learning. Books with repetitive phrases are best for beginners while fluent speakers can expand their vocabulary through longer more advanced bilingual books. I also love sharing books and activities with other families so that they can benefit and develop that love of learning. I am a school librarian for a magnet school that teaches the following languages: French German, Russian and Spanish. Bilingual picture books help students of those languages practice their vocabulary. They also come in handy for students whose mother tongue is not english. If they find a dual language book of their native language, they can take it home and help other family members with English. Foreign language teachers sometimes ask students to check out bilingual books to read a s a class assignment. Surrounded by books of all kinds while growing up, I have been an avid reader since early childhood. I would donate the bilingual books to the many early childhood literacy programs in my city which give books to needy families. Thank you for this opportunity to win free language books. I use books in Korean to help our foreign students feel more at home and to help them learn to read in English by comparing texts. Our Vietnamese children love seeing in print the stories that they know from their parents and grandparents. I use bilingual books at the bilingual French-English story time that I set up at my local public library in Lille, France. The French speaking librarian and I (native English speaker) read the same books in both languages, either interchangeably or alternating. The kids and parents, both bilingual and monolingual, love hearing the similarities and differences between the two languages. We have a fantastic BEd program where students are encouraged to read to their siblings or students that they are assistant teaching and these dual language books would be excellent for their activities. In addition, some of our lower level foundations students would benefit from the practice of reading in both languages to their siblings as well. Reading to young children helps stimulate language development, which in turns helps children gain pre-reading skills that will aid them in kindergarten. This is especially true in families that do not speak English in the home. I’m the project manager for Reach Out and Read Wisconsin, which works to decrease the discrepancy gaps between lower and higher income children’s kindergarten readiness by partnering with physicians to prescribe books and encourage families to read together. Any bilingual books I win, I will give to clinics so that parents have books that they can share with their children in their native tongue. Forty percent of our school speaks another language (primarily dialects of Chin, but some Spanish also). Not only do we use bilingual books to aid in vocabulary instruction for our EL students, I like to use these books with my English speakers. It gives them an idea of what it is like to not understand the language of your learning and leads to empathy among my students. This contest opportunity could not come at a better time! We suddenly have six non-English speaking students enrolled and I’m desperately looking for Spanish and bilingual materials for low elementary level, junior high and high school! I would love to share these with the mainstream classroom teachers so that they can use them in class when the students are not in the ESL classroom. I have used these books in my room for almost 52 students and these books have helped them in different ways. The bilingual books help me keep up my Vietnamese as well since my family lives far away. I would use this opportunity to get books in Spanish and Czech to help teach my children. My main language is English but I am hispanic and my husband is Czech. So, I would like my children to be tri-lingual. I can’t wait to use bilingual books to improve and encourage family literacy time at home. I want to help the parents of my students to be empowered to help their children. I also want to use the books to encourage the importance of creating bilingual citizens of the 21st century. I am learning Hindi and also trying to teach my son Hindi letters and words. His Papa is fluent but can’t read Hindi, so books that have Hindi/English are the most helpful for our situation. I am also working on transliterating Hindi books but it is a long and involved process. I love the Language Lizard books because a lot of them are in both Hindi and English! We use the books to tease out new words, numbers, verbs, and then reinforce them in our daily conversations, games, etc. We’ve found that the more outlets we have for learning Hindi – books, cartoons, conversations with friends/family, the better. As an ESOL teacher, I would love to collect bilingual books that I would use in my guided reading groups. This will be the best way to teach reading skills in both languages. What a contest! I was SO excited when I read about this. However, I grew even more excited when I learned about the whole site. My family is bilingual and we are desperate for my toddler to master both languages, because it is crucial for understanding his culture. That is why I find this site to be such an incredible resource! I would LOVE! to win. Since birth I have been teaching my 17 month old yoruba; in a world where only some foreign languages get priority, it has been near impossible to find resources like a simple bedtime storybook in my language. It was a blessing to find language lizard and winning this would open so many doors for my son and future children. I use bilingual books to help students who do not have enough exposure of Chinese language. The students benefit from this type of books greatly because they can use the English text to help guess the meaning of the Chinese characters. My children love to read and listen to stories in Spanish and French. This also helps increase their vocabulary. Books are great. We are in a unique situation to use books and early literacy as a teaching and developmental tool in doctor’s offices. Though a midwest setting, our city has pockets of ethnicity in various forms – international students, migrant workers, hispanic neighborhoods, etc. Bilingual books are used to give BOTH languages a positive place in the education of a child and as a confidence building tool for parents/family members to feel comfortable spending time with their child and books. Bilingual books are a big hit with our families and our doctors, nurses and volunteer readers who give the families early literacy guidance! Having bilingual books in our library builds a sense of world community as it reflects the various languages and cultures in our school. Enjoying looking through the website for the first time. Nice job! If I were to win the contest, I would be delighted to have new books in my classroom. I would even share with another teacher…or two! I teach newcomer ESL middle school kids, and we are always on the look-out for new ready material for them while they learn English. Bilingual books help SO much! Bilingual books are a great way to help our spanish speaking students and their parents. Students and parents get to have the wonderful experience of sharing great stories. Our agency now has several dual language classrooms and I am very excited to have the chance to be able to give our Head Start children and families access to a greater variety of bilingual books. This contest is a wonderful opportunity for our program! I am the RIF coordinator for an elementary school. We have a large and growing population of ESOL students and their families. Located in a very rural area, dual language materials are extremely hard to find. If materials are located, it must be by internet and costs are prohibitive because of budget costs. Winning this grant money would be heavenly! With the majority of our students speaking Spanish at home and with a dual language program on campus, these bilingual books will be a great resource for our students and teachers. Many of the bilingual books we have or old and out-dated, new books for our students to get excited about will be a most welcomed addition. It’s a great way for staff to pick up a few words in families’ home languages of Oromo and Somali as well as a great way to show families and youth that we are in support of their family culture and don’t want them to lose their other languages. We have had a lot of Japanese speaking students move into our area recently. I am scouring around trying to find anything to help them acquire some language, as well as help our students learn simple phrases to communicate with them. Bringing Biligual books and information is etremely new to our center. I know the children in our community will truly benefit from this opportunity. We are using bilingual books to support at-home literacy through literacy kits and a series of six literacy events at an elementary school. I use bilingual books to help me transition into reading in a language that I don’t speak fluently. I speak French, as well as English, with my children, and I am also teaching them as much Chinese and Spanish as I can. When I first started reading to my kids in Spanish, I used a lot of bilingual books; the first time we read a story, I would read each English sentence first and then read the same sentence in Spanish. The next time around, I would read the whole story in Spanish straight through, occasionally throwing in an English word or sentence if they asked me what something meant. In this way, I have greatly improved my own level of reading comprehension in Spanish, and my children have graduated to listening to many all-Spanish stories! We still use bilingual books when we read at more advanced levels. When I can find French/Spanish bilingual books, I can improve my kids’ Spanish comprehension and reinforce their French-language skills at the same time. I also like to point out the similarities between French and Spanish words when we do this–great preparation for learning Latin a few years down the road! Bilingual books have been even more crucial to us in learning Chinese, because it is so much harder to learn to read Chinese independently! When I read Chinese-language children’s books, I often have to sit down beforehand and look up several words on each page in my dictionary. Having the English translation of each sentence right below really saves me a lot of time and energy! If the pinyin transcription is also given, I can usually read the whole book with no dictionary work. Having bilingual books also means that grandparents and other family members can read more of my children’s stories to them even if they don’t know one of the languages (my father can read in English and French but not Spanish or Chinese, for example, and my husband’s mother can read only in Chinese). I use biligual books to encourage parents that are English Language Learners to interactively read with their children who are struggling with English. Our school holds a parent class which requires the parent to bring their own child to receive instruction about stragegies to enhance reading at home. The parent gains self confidence because they are able to participate using text in their own language which improves the chances that interactive reading will start to happen at home. I am a reading teacher servicing students from 1st through 5th grade. The majority are English Language Learners from Arabic, Farsi or Somalian language speaking homes. I am a librarian in a small town public library. Over 25% of our population is Hispanic. Unfortunately, we have very small book funds due to budget cuts. I would love to expand our bilingual easy readers, as these help the parents as well as the children. I’d also like to get more bilingual non-fiction for our patrons. I would love to put these books in the classrooms of teachers who have my ESL students. This would be great to go into the classrooms of teachers who have ESL students. I am a retired teacher. I currently volunteer in an elementary school and work with groups supporting children in this country and overseas. The bilingual books would be gifts for the children I work with. We have many bilingual students at my school. Since we can’t teach all languages in the classrooms, we use these bilingual books to support home language, and to expose all children to the variety of languages and orthographies! The books from language lizard are always really popular selections in our libraries! I am using OPOL to raise bilingual children and am desperate for more book that both myself and my husband can read to our son and future children. Thank you for what you do! I know many people who have grown up in bilingual homes who speak a language fluently, but cannot read or write the language. Books are an important piece of the learning experience! I think bilingual books are great for children. I’ve searched all over and this was the only place I found Croatian-English ones for my one grandson. I’ve also gotten Spanish-English for other grandchildren. I’ve also recommended this site to others over the years. The books from this website are high quality, beautiful books, appropriate for our age groups. I always wish I could buy more! We have about 26 native languages in our student population. I love having books they can check out that their parents, who may not know English well, can read with them. In the Early Reading First preschool program (EARLY), we use biligual books to encourage parent involvement. Monthly, children take home a book to keep with activity ideas related to the book for family engagement. In my life outside of work I purchased bilingual books for a dear friend when she had a baby. Her mother-in-law does not speak English. When she came to help care for her newborn granddaughter, there were books in her lanmguage she could read to the baby! I have to come to rely on auto spell check! As an ESOL teacher, I plan to send home bilingual books with my ELL students. My goal is to help promote literacy in students’ homes, by providing them with books that they can read together with family members, in both their first and second languages. What a wonderful resource, and critical to encouraging our ELL families to become involved in school activities. Having a generous supply of multilingual literature displayed prominently delights parents when they come through the door, and makes them and their children feel like valued members of the school community. Bilingual books are a great tool for learning another language. They are not only good for kids, but also for monolingual parents. Bilingual books can help these parents engage in the foreign language, to learn some of the language and to show they support learning the other language. Books are a shared experience wiht a diverse group of kids to keep conversations going and vocabulary increasing, as well as to give a content-base for learning in any language, whether native or foreign. I read to my children in French and Korean and would love to expand their library and have to share with the kids in their classes. What a wonderful give-away! Hi from Quebec, Canada! What a fabulous idea to create bilingual books! I’ve thought of adding stickers to my kids picture books before and never took the time to do it. This is such a great idea. I am so grateful that someone decided to do this. I have 4 children. 2 at a trilingual school and 2 in daycare. My second oldest always asks me to translate the book for him so I am always reading it in french first and translating it in english for him. I will start buying bilingual books for my children. Happy Reading Everyone! As an ESL teacher, I think it’s a wonderful idea to have bilingual books in my classroom. In my view, having these types of resources show that my classroom environment respects students’ home languages and cultures. As a librarian in a very culturally diverse school, I know how important it is for students to continue to read in their native languages. However, we have so many varied needs that meeting all of them can be challenging, but important work! I use French/English books in my classes for French for Elementary Students; Spanish/English in my ESOL classes. So happy to add more to our Italian language collection of books!! I really hope that I winn the book giveaway. My 6 year old attends Casa Esperanza Montessori which is has a Spanish immersion program. He attends Spanish immersion Kindergarten and my twins will attend (Hopefully winning the entry lottery!) next year for kindergarten as well. The books would really help out since lately I have not been able to buy books like I used to. i want my son to learn to read in vietnamese he can speak it. with theses books his father can teach him to read them. I love the bilingual books for teaching myself Arabic, and I can teach my granddaughter the language too. I know she will love the books as much as I do. The world is a big place and there is many people to teach, both language and culture and that is what I would like to do. Language Lizard is the place to begin I believe. I have not used bilingual books previously in my program but am excited to try them with my stage one and two learners. I am hoping the literature will draw the kids into reading and assist in their learning of academic language required for them to show learning in grade level curricular areas! We use the Accelerated Reader program at our school so I have started using the bilingual books for that. Students read the bilingual book but take the comprehension test on it in the target language. The questions are simple but it really requires code-switching on the part of the student to correctly answer. I use bilingual books all the time with my sons – we give them as gifts to our family in Chile – what a joy to see the happy smiles when a new favorite is discovered! These books are awesome! My husband is from Latvia and speaks Russian as his primary language. I have been learning the language, slowly. Now I am pregnant, and having a bilingual household is a must. I love the idea of these books, because I can learn Russian along with my baby. I would use bilingual books in my ESL classroom library for the students to borrow. I feel it is important to provide parents with native language literature so they can read to their children using authentic materials. Our program would use the bilingual books for our family literacy program. It will help us to get book in the children language to empower them to read. Some of our families don’t have books in their homes even in their own language. This contest would help us so the children and parents can check out book in their language. I am a librarian and also the grandmother of 2 bilingual children. Their mother, my daughter, lives in France and has begun a bilingual storytime under the auspices of the local public library where she lives. I would love to both let my son-in-law read the French while my daughter reads the English at in home reading and also let her use these books in the storytimes that she presents. I don’t have a bilingual book yet, but I plan to use it to enhance my kids learning of our native Language, Yoruba as well as Arabic. I would love to use Bilingual books to expose students to different cultures. I’d love to use these books to teach students about a different culture each week. I teach second grade in a Dual Immersion Spanish/English program. We have a limited supply of books as well as funds and I currently only have three small boxes of Spanish books in my room. I lead several Spanish literacy groups per day as well as encouraging my kids to become passionate readers. I treat reading time as the most exciting time of the day and I get my kids dying to get their hands on a new book. I teach at a school with 34 different languages. I am the the librarian and would love to have more books in a variety of languages. We have 500 students who use our library daily. We know the secret to successful reading is reading more and more and more! We have a significant number of patrons who speak Spanish and English. I would love to have bilingual story hours here at the Library with these wonderful books. We try to encourage early literacy and work closely with our local Council of Government preschool and our HeadStart school; some of parents of students are in the process of learning English. Celebrating diversity is an important part of our library’s mission so, what better way than providing bilingual books! I use bililngual books to help children and adults to learn Englis. I also recommend bilingual books to other English-speaking patrons to learn a target language. We are an early education non-profit that provides supportive guides and games to families that have infants and toddlers to empower them to be the best parent they can be. Colorado Bright Beginnings is dedicated to providing as many books and learning experiences in a family and child’s life as possible. Our materials are free to all families and we often hold groups in the community and give books away to the families. We are often emphsizing the importance of reading with the child regardless of the age and these books will be an excellent way for us to continue to emphasize the importance of early literacy and language skills. I am very excited about adding bilingual books to my school library. I see those books as useful tools in teaching English to my English Language Learners. The books will help them to expand thier vocabulary and how the bilingual books can bring the stories to life to the students in their native language. these are great books. we love them!!! I would use these books to help my son learn a second language. They look fantastic. Thanks so much for offering them. Love to use bilingual books in my class. There are students that speak more than two languages so they could benefit from the exposure to maintain the home language. We’ll use these books with our bilingual daughter and with our Arabic playgroup which is just getting off the ground! I’m an ESL teacher and speak Spanish and French. My hubby is Chilean and speaks English and Portuguese. We’re language lovers and an auntie and uncle to lots of kids, so we’d definitely use the books with them! Being both a language teacher and student myself, I’m always interested in the language learning process and constantly looking for new tools to use. Plus, though we’re newlyweds now, we definitely want kids in the future! I love to read to my son in French, makes evening storytime so much better for me! And he picks up words so easily! My daughter is only three months old but my husband and I have already started reading to her in multiple languages. Between us we have six languages but only one in common; hoping that this will change as my daughter picks up her papa’s native Russian that I will too! Using multi-lingual books not only helps introduce new words to our daughter, it is also a great way to share the vocabulary with the people at her daycare. Bilingual books are a great to teach a second or third language. My three year old loves being exposed to the different sounds and looks of these foreign languages. It is so hard to find a great source like Language Lizard and I am so glad we did! We love reading the Albanian books to my daughter and she loves them! Its a great way to keep fluent in our language. As a teacher I can use spanish books in my preK class where the majority of children are bilingual. We keep a bin of Spanish books and take them out when our Spanish speaking friends come over, and read together. My girls love to read in both English and Spanish! I would love to be able to donate English/Spanish books to my son’s bilingual PreK class. I love your site!! Thank you for the opportunity to enter your Giveaway Contest! I am teaching my girls French and they also love Spanish. I am passionate about exposing them to other languages and cultures and bilingual books are an excellent means of doing so! My children are being raised bilingual in Dutch and English. Dutch books are hard to come by. I am also teaching them French and bilingual books are particularly useful for refreshing my language skills while teaching the kids. I would love these books for my children who are bilingual in Mandarin/English and learning French. It is so hard to find quality books in Mandarin. I would also give some my son’s new Mandarin immersion school which is just building their library. Bilingual books are the treasures of engaged parents and vital working tools of teachers! At PIQI Play School we teach English and Portuguese SIMULTANEOUSLY and have been searching far and wide for appropriate books just like these ones, what a joy to find them. This would be a brilliant resource for our youth club and after school club. We work with children from many different backgrounds with a whole host of languages between them. Some are newly arrived and it would be a great help to their English acquisition if we had a range of bilingual resources. We are also very keen to celebrate people’s mother tongues and the cultures that are embedded within them- it would be wonderful to have resources that could be used to kick-start creative uses of mother tongues, and a way to get whole families involved. I’m raising my daughter bilingually, English and Romanian. She’s 3 now and fluent in both. I’ve started teaching her the alphabet in English and plan to teach her to read only in En at home and leave the other language for the school to teach her. Bilingual books are good for learning to read bothe languages. It’s important to keep my family’s Cuban roots alive, including Spanish. That’s why I think it’s important to read to my 2 year old daughter in both Spanish and English to ensure she learns and preserves the language in our family. I am a new ESL teacher and I am excited to learn more about your website and the resources you offer. I am excited about using dual language books and my students have been asking for them, so your website came to me at a perfect time. We LOVE using the Language Lizard books when we host parent education nights at the school districts we work with across Chicagoland. In addition to the excellent variety of languages available, I love the fact that the content appears in our ELL family’s home language as well as in English. We strongly encourge the families we work with to read together. Language Lizard books help make it easier for families to retain the home language and learn English. Since our goal is to send every family home with at least one book that helps make this possible, Language Lizard books are highly treasured. What a great opportunity! Bilingual books are such a great way to bring in the students’ home culture and to read for understanding. My son and grandson (including myself) can really benefit from learning an important second language such as Mandarin Chinese. Since our three generations are born and raised here in the USA, we are losing the ability to speak and communicate in the language of our ancestors. Thank you so much, Language Lizard, for providing us the tools and resources to learn a second language and hopefully become bilingual. I plan to share the wonderful bilingual books from Language Lizard to a school or library. I love multi-cultural books. The parents and children that are in our program leave with a smile on their face when they are able to chose books that reflect their culture and are in languages that they can read. i love to see the awe in my children’s eyes when i read to them in spanish! I have established a literacy bag program with my ESL students. My students love being able to read the books in their native language and English. It is a great way to connect with the parents. I try to include a bilingual book as well and books in English that relate to the theme of the book. The $250 would be used to increase the number of bilingual books that we have to share. I would use the titles to enrich our story times as well as recommending them to our bilingual families. My sons love reading Chinese books. It adds a lot to their enjoyment of the language. I would use these books for them, and give some as presents to a group of friends who have adopted children from China. I’ve been asked to teach Chinese to some of these children, and these books would be a great addition to a language learning environment. I keep bins of Spanish-English books to send home with my ESL students, so their parents can read aloud to them in their first language. I have only a few English-Mandarin books and more Chinese students every year, so I’d love to do the same for my ESL students from China. At my own expense, I offer a home literacy program to my ELL students. Each week students take home a bilingual book in their native language for their parent/caregiver to read to/with them. This encourages the use of native language which facilitates the acquisition of English, and provides a parent as educational partner connection with my classroom. Parents are so appreciative because many cannot afford to purchase books for their children. The bilingual books also create an additional opportunity for the parents to have access to English. One parent, whose first language is Gujarati, thanked me very emotionally for the opportunity to read to her child in her own language. She remembered the story from her own childhood when her mother would tell it to her. As they say–PRICELESS! Thanks, Language Lizard! I spent 2.5 learning Spanish in High School and tried to brush up in college. I think it would have stuck a lot better if I had been able to read books I enjoyed in the language instead of just the textbook and vocab. I know there are kids in my son’s school who have come from other countries and are trying to maintain some of their heritage through reading books in their native language and I think its great!!!! Although, it’s not foreign we have been teaching my son ASL to help with his communication delays and if he ever decided to use it it may be a valuable skill for him to use as an adult to translate for others! I’m sure this is true of any foreign language also! I used bilingual books from Language Lizard for a bilingual story hour program at our local library. I live in a small town in rural Missouri, and the program enabled me to enlist other local speakers of languages other than English to help and provided a fun event for the children that attended. At each session we taught the children a few basic words in the other language we were working in that day (Spanish, French, Mandarin Chinese, Russian) and also did a variety of activities after reading the story. The program was well-received, and we’re going to be reviving it in a few months’ time. This time I’m working to get college-age volunteers to come help on a regular basis, and I’m working with them to find out what the stories are that they read as children to see if we can find the bilingual versions of those. That way it’s both bilingual and bicultural. It’s a lot of fun, and I also do the bilingual approach with reading to my son. Your company provides an awesome service to parents that are raising bilingual children. Thank you so much.